With the increasing use of technology in modern times, there is a growing requirement to provide effcient technical support. Our technical support team is often subdivided into tiers, or levels, in order to better serve a business or customer base. The number of levels a business uses to organize their technical support group is dependent on a business need, want, or desire as it revolves around their ability to sufficiently serve their customers or users. Our reason for providing a multi-tiered support system instead of one general support group is to provide the best possible service in the most efficient possible manner. Our industry knowledge in Japan and development infrastructure in India is in a unique position to provide services of custom software development covering various stages including system analysis and design, development, implementation, training and maintenance. Our support system staff are very knowledgeable, easy to communicate, resolve problems quickly, ready to give additional technical support and always there for our clients. Our product managment constantly measure the effectiveness of processes and strive to meet more difficult objectives to satisfy customers. From our exploratory research we found two useful models to visualise design growth and design status. A clear interaction with each of our clients and our understanding of the present business requirements will be focussed to always give a better quality product. Our product development was done under a clear objectives, guidelines, and requirements in an environment conducive to high productivity is absolutely essential to designing and producing high-quality software.Which is the key point for the success of your prouct qulaity and technology. Some issues addressing the qulaity of a software include: evaluations of software products based on predicate devices; documentation requirements that emphasize software safety and computer security; software properties that may affect the safety of the total system.A good quality product undeniably brings positive contributions to the success of a business. One benefit is customer satisfaction. Our product documents stays alive, growing and accurate. The users always see the most recent, accurate information for a successful business solution. Our product documentation is based on its functionality in the correct strategy and task-based.Our product documentation tells your clients how to use your product to achieve their goals.To be complete, the documentation must be more than a mass of information. It will be pertinent to your product and well-explained from the users' point-of-view.Focussed documentation ensures a higher readership and more effective use of your product.All information must be found easily, regardless of the size of the documentation suite. Our standard partner and customer training courses cover a variety of topics and are targeted to a range of knowledge and skill levels.Our training program focuses on the better understanding of all the features in our product to completely explore all features. Our training focuses on simple methodolgy of teaching and easier and faster way for the knowledge gain.We focus that every end-user should understand very well on their job function without any ambiguity. 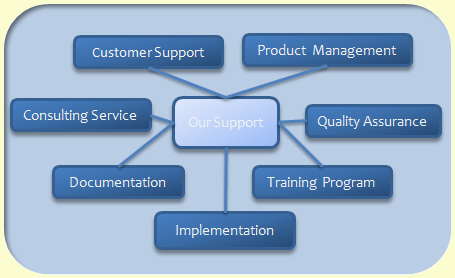 Our product implementation strategy ensures shorter implementation cycle. Our product integrates well with transactional and datawarehouse systems. We also provide standard plug-ins / APIs for other enterprise products used in the customer companies. Leveraging our extensive industry and software technology experience, we at Sysveda ensure fast, smooth and risk-free product implementation. Our consultants go beyond simple staff augmentation, providing project assessment services and project monitoring. We don't just provide additional manpower. Our focus is to assure your success through expert project assessment, planning, and management. With in-depth industry experience, business insight and cutting edge technology, we help our clients make informed and wise technology investments which are in synch with their business objectives. Our business portfolio is designed to deliver cost effective and end-to-end business solutions right from conceptualization to implementation with a focus on enhancing productivity and maximizing business performance. The technical team is talented, dynamic and motivated technocrats who have a blend of high technical proficiency, strategic business insight and well-honed project management skills.Our product condition changes over time and will be managed as it moves through its succession of stages to improve the business of our clients.